I've written before about how much we loved Little Passports when we had the subscription. The kids loved getting them in the mail, and they are great for all ages. Sam and Eva got their little suitcase starter kits and carried everything in them. The older kids got their bigger-kid kits and learned geography and all sorts of other fun things. Today Little Passports is bringing you some travel tips for the upcoming holidays (or summer vacation, or just an hour-long trip to the apple orchard, like we took recently!). If you use my link to purchase, you get a great deal and a great learning activity for your kids. It's the perfect birthday or Christmas gift from grandparents or Santa! “Are we there yet?” was a term coined by the family road trip! While new technology and toys may have silenced backseat conversations, spending time together in the car can still be a great opportunity for family bonding and learning. Even if you plan on bringing the latest gadget to pass the time, try saving them for the end of your trip when everyone is tired and cranky! 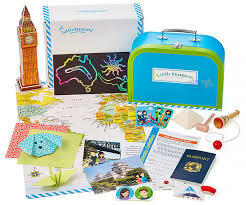 Save your most recent Little Passports delivery from Sam and Sofia for your road trip so your kids to learn and explore during the car ride. Say goodbye to your trusted GPS! Bring back the memory of car trips as a kid and use a map! The night before your trip bring out an actual map (if you can find one!) to show your intended route to your child. Even better, copy the map and pull out a highlighter so your child can follow along – and let you know when you missed a turn. Build in time for pit stops – and if time allows, make short stops that incorporate fun activities along the way. Everyone will need a bathroom break and a meal, but if that happens at a place right off the highway and near playground it can be better for everyone! The kids will get fed – and burn off some energy. Hit up a dollar store before you leave and stock up on small toys and activities to give to your kids along the way. Every hour let your child choose a surprise – a great incentive for good behavior! You can even wrap the toys for an added element of excitement.